Can you hear yourself using any of these statements or ones very much like these? Do you hear similar statements from others? Such statements are an indication that a knowledge of “people skills” is lacking in the interactions or relationship. 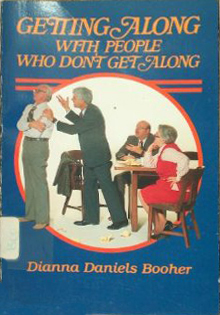 Help is needed in knowing how to get along with people who don’t know how to get along. Dianna Booher, in introducing Getting Along With People Who Don’t Get Along, says: “Because Christianity is a relationship with Jesus Christ, we practice our faith by establishing relationships and dealing with others by His example. They are a practical application of our faith—using people skills at church, at work, and at home.” This book offers specific help to make that application.